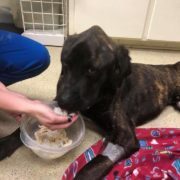 In a very disturbing animal cruelty report, two dogs were thrown from a dark blue vehicle on Interstate 81 near Ithaca. 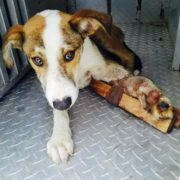 One of the beagles will lose his leg – he suffered the worst injuries. 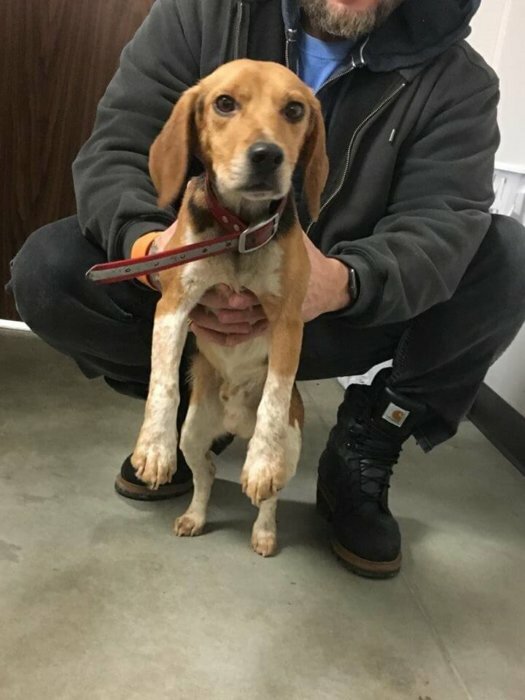 According to the Broome County Humane Society, on Wednesday a tractor-trailer driver stopped to help the beagles after witnessing the dogs thrown from the rear of a dark blue Dodge Durango. He was not able to copy the license plate number. 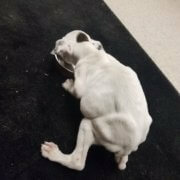 The truck driver wrapped the six-year-old badly injured dog in his sweatshirt and waited for authorities to arrive. “Our hearts are breaking right now. These sweet dogs were allegedly thrown from a vehicle on Route 81 North. The dogs have been named Trooper and Adam; in honor of those who helped them. 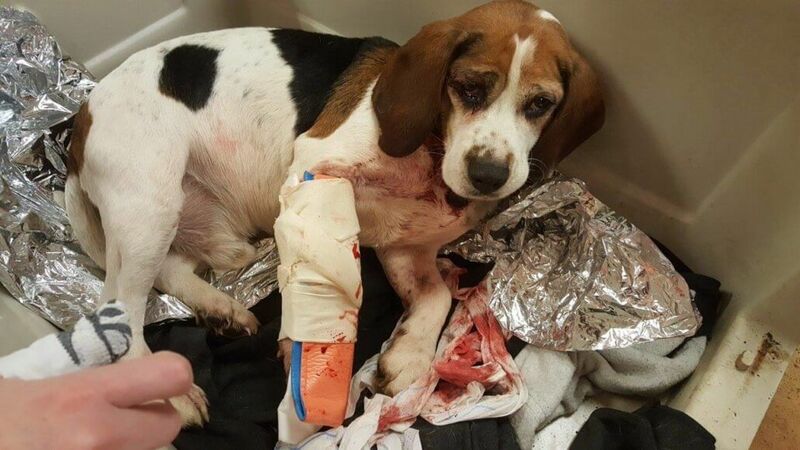 The beagle, named Trooper is currently being treated at the Colonial Animal Hospital. 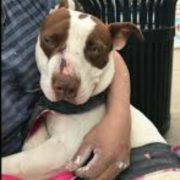 Donations are welcome in order to help with medical expenses for these sweet dogs atwww.bchumanesoc.com or DOUBLE YOUR DONATION by donating through the Staffworks Save a Life Campain at https://foundationhoc.org/2018-staffworks-save-a-life-camp…/. As of the latest update, Trooper’s surgery went well, and he is slowly recovering. Please contact the New York State Police if you have any information on this crime. Follow the National Pet Rescue on Facebook and read the latest animal related news. 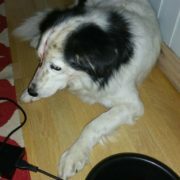 Senior dog in need! Does anyone care about Ruff? Past his deadline and in danger. More here. 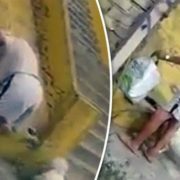 Yesterday: Dog jumps over side of five-story garage to reach his friend – more on this tragedy here. Enter Rescue10 at checkout for a 10% discount! Your purchase helps support our writing efforts. Nope, not letting you out! No, you will only pet ME! 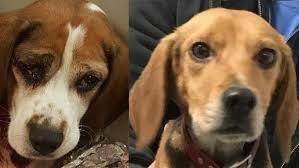 Thanks to the truck driver for rescuing these two innocent beagles as well as NYS police for also coming to their rescue. 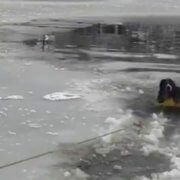 So glad both dogs are alive although one may loose his leg. If you don’t want your dogs anymore, take them to a shelter you vile monster. People like this need to be away from those who care about life. 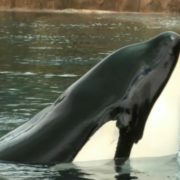 Hope the scum who did this is found and thrown in jail. Beagles are one of the sweetest and most gentle breeds of dogs there are … over 25 years ago we had Bing and Bo a brother and sister … What wonderful little dogs.